In reaction to a spike in gun violence in D.C., an organization is seeking to improve the lives of youth through a free summer camp. GOODPartners -- an organization created by four Georgetown University students -- was created to help disadvantaged youth in the D.C. area. Now the group, along with D.C. Del. Eleanor Holmes Norton, is launching a free five-week-long camp for kids, known as GOODCamp. Through the instruction of professional athletes, the program aims to teach children determination and persistence. The camp will offer both athletic and academic training. The athletic portion of the program will be headed by Haden Sports and Performance, an athletic performance studio run by the father of Cleveland Browns cornerback Joe Haden. Darius Baxter, one of the founders of GOODPartners, said he expects 150 campers and 30 counselors to participate in the camp. Former players of the Saints, Vikings, and Redskins are also expected to attend. Participants of GOODCamp will be partnered with students from DIVVII, a student mentorship program based in Shanghai, China. Baxter hopes that this partnership will encourage structure and creativity. 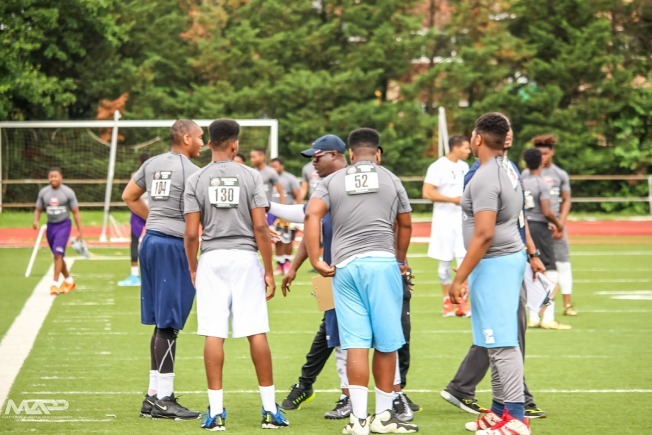 Anacostia Senior High School will host the camp, which begins June 27 and runs until July 29. Registration is available online here. The camp will be held Monday through Friday, starting at 9 a.m. each day. "We developed this curriculum to begin right when school starts and end right as football season is beginning," Baxter said. "My grandmother always says 'Idle time is the devil's playground,' and this camp is taking the option out and replacing it with opportunities for the kids to develop skills they would not normally get in a classroom during the school year."